I was recently invited to write an article about the Minimalist style of decorating; here is my interpretation of the style. The style is not restricted to “modern” furniture in a contemporary minimalist interior. In fact heirloom, mid-century or simple rustic furniture can be an interesting juxtaposition to the clean lines of the interior. You can still have a space that reflects your personality and history without filling the room with clutter. overhead are the key features to the room. And that last point is key... Having a minimalist interior is an exercise in restraint; Coco Chanel’s famous quote "Before you leave the house, look in the mirror and remove one accessory" is perfectly relevant for this interior style. It doesn't mean creating an empty room; it is about carefully considered selections. I have no doubt you are curious about how your favourite designers style their own space? Are they completely conservative at home or wildly creative? Or perhaps designers are like proverbial plumber with the dripping tap that never quite gets their own project done? Here is a look at my place. When it comes to my home I have surrounded myself in the colours and textures that make me feel comfortable as well as mementos and photos of good times or special occasions. My master bedroom is painted in Dulux colour "Thermos" which is a warm caramel colour that I have complimented with a deep grey in the accents (like the tiles on the hearth and en suite and with black and white photos). A consistent colour through the house is green. Whether that be the pot plants and fresh flowers that are a constant, the floral pattern on the kitchen blinds, the moss coloured walls in our fun playroom or the soft furnishings and patterned rug; Nomad Totem in the family friendly living room. Mr. 6 has requested an "under the sea" theme, so I have styled the room in this way with a few family treasures such as the chest a great-great grandmother used when immigrating to Australia and the handcrafted patchwork quilt made by Grandma from a collection of old checked shirts. The effect of the room is that it feels much larger (because your eyes are drawn to the perimeter of the room by the stripes), and already a favourite room in the house. I've very happy with my paint work and would love to hear your thoughts too. 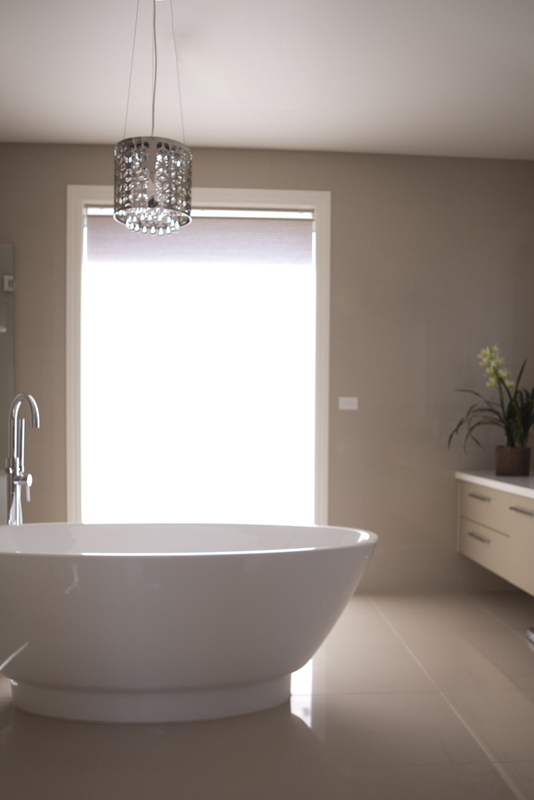 Even though your bathroom may be small, always consider the view when you enter the room when planning the layout. It’s far better to look at an attractive vanity or freestanding tub than looking straight onto a toilet commode. Stealing space from the walls for recessed shaving cabinets, for niches in the shower to hold your shampoo or for the cistern are all useful tools. But also look beyond the walls to the rooms behind; I have had great success taking space from a neighbouring rooms robe, or over sized guest bedroom which has resulted in being able to squeeze a separate freestanding bath tub which otherwise would not have been a consideration for a small bathroom. Call me vain, but I want to look my best when I’m in my bathroom, so I like to select light neutral toned walls that won’t make me look sallow (like a blue, green or yellow room would for example). 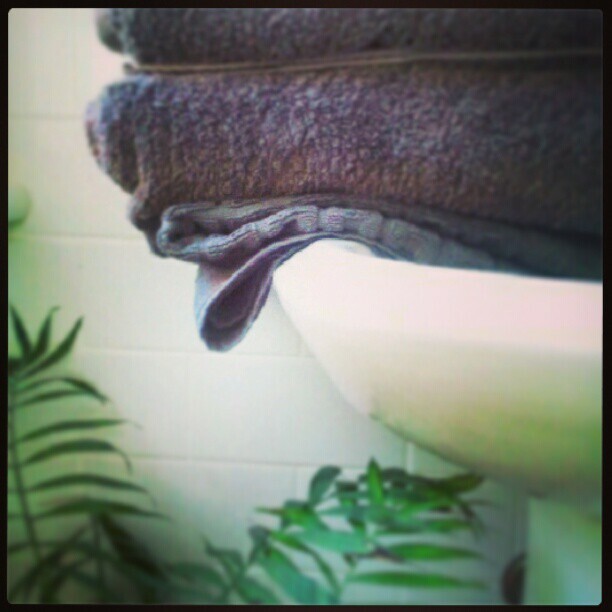 I then use my towels and accessories to add seasonal colour. These are then also easy to update as trends change. Of course hiding your clutter behind cabinetry is my best tip for keeping the room from feeling crowded, so don’t overlook good storage in your mirrored shaving cabinet or under your basin. Just because the room is small does not mean you have to do away with luxuries. Indulge in the best quality finishes you can afford, including tiles (I like to see reflective gloss finishes as they help the room to feel light and airy)… it’s not like you’ll need too many tiles in any case; it is a small room! Creating this boys bedroom was a pleasure. For this room my client trusted me when I recommended a painted feature wall would be the best way to ground the room and add interest. 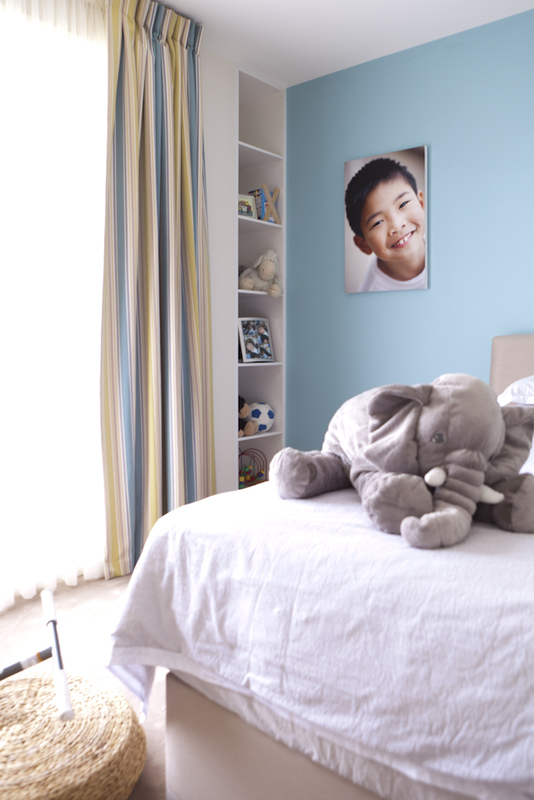 The paint is particularly successful as the selection (Dulux colour "Squirt") is a blue that is warm and comfortable. Multi-coloured striped floor to ceiling curtains that compliment the colours already in the room; carpet, paint colours and bedhead complete the desired effect.